Oh. My. God. What just happened? How did that scoreline come to fruition? 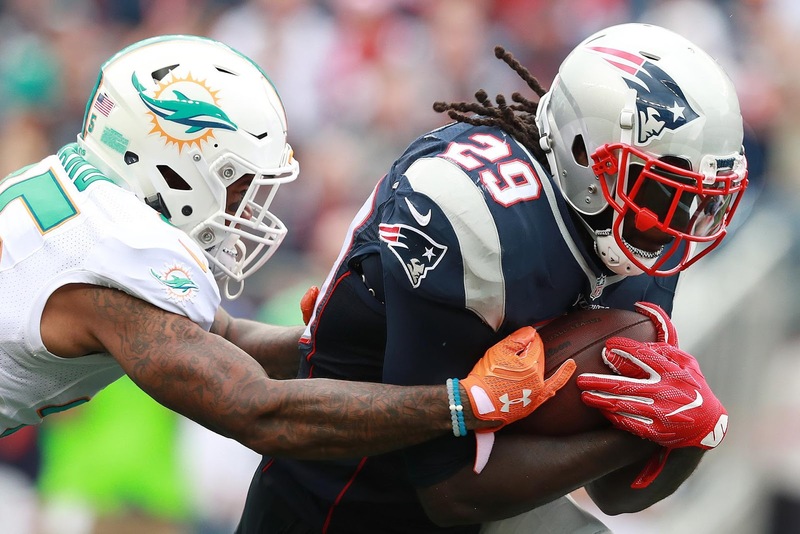 New England staved off a huge comeback attempt against Miami, improving to 2-0 on the season, but it came with a steep price and did not come easy by any stretch of the imagination. Everything started off so well; Jimmy G was firing on all cylinders to begin the game. For the second consecutive week, New England capped off the first drive of the game with a touchdown, this time to Danny Amendola, who ended up with two TD catches. The defense wasn't allowing anything to get going on the Miami side, holding the Dolphins to just 85 yards of total offense for most of the first half. A few of the offensive weapons that didn't get too involved last week, namely Martellus Bennett and Danny Amendola, were real difference makers in the passing game, helping Jimmy G to 234 yards of passing and 3 touchdowns, all resulting in a 130 QBR. On the defensive side, Chris Long looked like he had returned to his old self, totaling 2 sacks, a fumble recovery, and was constantly in the backfield making tackles and pressuring Ryan Tannehill. The secondary coverage was solid in the first half, with Tannehill barely completing 10 passes. Unlike last week, turnovers were huge for this defense, as they recovered two fumbles and picked two passes off. However, this game was a story of two halves. Right before the first half ended, Jimmy Garoppolo escaped the pocket, rolled out to his right, launched a pass to Malcolm Mitchell for a first down, but got crunched by Kiko Alonso, injuring his right shoulder. This is worst case scenario number one for New England, as Jimmy was looking extremely promising before he went down. He seemed to be in a good amount of pain, but his X-rays came back negative, with no broken bones. The fear now for Jimmy is a right shoulder AC strain, which varies in terms of return time; but for now, it looks like Jacoby Brissett will be the quarterback for New England going forward. In the time that he was on the field, the rookie didn't look too shabby; he had good movement in the pocket, had accurate passes, and led the Patriots down the field twice, which is all we could ask from the NC State alum. However, the offense was not the problem in this game. Seemingly right after Garoppolo went down, the defense decided to stop playing. Downfield coverage was a disaster, as Tannehill was 24-27 in the second half for around 270 yards and two touchdowns. The pass rush was almost nonexistent, leading to Tannehill completing so many passes. In New England's defense, the score at the time was 31-3, and Miami had nothing to lose, so I'm sure New England didn't play press coverage but instead gave the Dolphins receivers plenty of room to run and catch. Although, that doesn't excuse their horrid play towards the end of the game, as they let one of the worst offenses in football march down the field drive after drive, and didn't follow their motto of "Bend, Don't Break." I'm sure Bill Belichick will have some choice words for this unit in the locker room and at practice this week, but they won't have much time to fix their breakdowns, as Houston comes to town on Thursday night. -Bill Belichick made some questionable calls, notably not going for a field goal at the end of the first half and deciding not to challenge Jay Ajayi's catch on the sideline that led to a Kenny Stills' touchdown. All in all, the Patriots played an average game. They performed amazing for the majority of the first half, leading Miami in yardage 285-85 at one point. However, after Jimmy G went down, everything seemed to fall apart on both sides of the ball. The defense will surely get an ear full this week at practice, and hopefully Matt Patricia and Belichick can fix some of the issues that haunted New England in the second half. As long as the defense can hold together, Jacoby Brissett proved he can handle this offense, and should be fine if asked to start against Houston this Thursday.